From just after WW II to the early 1970s, one of the places to be on a summer Saturday night in a small corner of west-central New Hampshire was at a square dance where changes were called by Glenn Pease of Orford, NH. Glenn was a farmer, selectman and Grange member who was born and lived all his life (1906 to 1989) on a 110-acre hill farm in the shadow of Mt.Cube. Beginning in the late 1940s, Glenn called changes for square dances at a variety of dance halls and other venues within a 30 mile radius of the farm. He called summers at Camp Lawson on Stinson Lake in Rumney and the Lake Tarleton Club in Pike, as well as a several-year stint at Huntington's Pavilion in East Thetford, Vt. 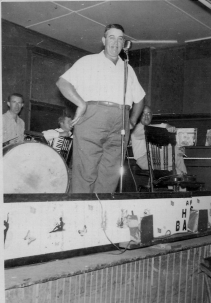 The majority of his calling, however, took place at three halls: the Rumney Town Hall, the Warren Town Hall and the Painted Barn in Wentworth and for all of this time, he called with Pat McIssac's Band. Pat's band included four or five musicians, several of whom played together for over 25 years. The majority of the evening was taken up by waltzes, foxtrots, and polkas, with two sets of three square dances each and one 'string dance', "Lady of the Lake", always danced just before intermission. Many folks in this area of New Hampshire and Vermont have fond memories of attending these dances, visiting with old friends, and whooping it up during favorite squares and polkas. To relive some of that old-time fun, read more about Glenn and his calling career, view several photos, read the actual calls to the squares, and listen to recordings of parts of two complete dances, check out the following pages.